Harvard University professor David Edwards continues to up the ante on multi-sensorial immersive experiences. His O-Phone made smelly waves earlier this year as the first olfactory messaging system available on smartphones. 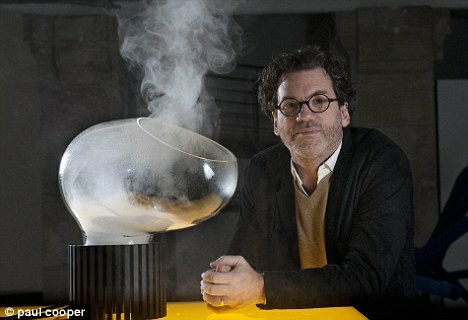 His work at Le Laboratoire – Paris design think tank – has landed in Cambridge’s Kendall Square. This US sister lab has everything to delight modern gastronomes, designers and scientists alike. The most exciting feature is the stunning Le Whaf at Le Laboratoire’s dining lab, Café ArtScience. Designed by Marc Bretillot, Le Whaf is a bulbous glass vaporizer which liberates flavor and aroma from their solid material form. It’s various air concotions enhance dishes and drinks as well as offering a calorie-free after-dinner mint.